Next, I wrote down all of my fears in my journal (which were actually a lot fewer than I realized) and did a Fear Clearing (Hypnobabies hypnosis track for releasing fear) session to try and release them. Then I wrote down Theda’s birth story as though it had already happened, to help my visualization (I’m a writer, and having the concrete image on paper helped me focus on it). Later that evening I also told husband about my fears, and we talked through each one and what would happen — how everything would turn out right in the end. I went to bed feeling a lot more at peace with my body and the induction. Theda was WILD that night as I was trying to go to bed. It really felt like she was trying to find her way out (we joked after she was born that she was trashing the place before she was evicted!) and I hoped it was a good sign of things to come. 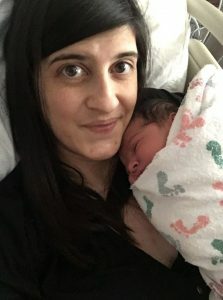 I’d been feeling some irregular pressure waves (Hypnobabies word for contractions) that evening, with the telltale cramping feeling that I’d felt the entire day before my birthing time (Hypnobabies word for labor) began with my son. At 3 or so that morning I woke up to my usual pregnancy insomnia. I was also having more waves! I began timing them and discovered they were each approximately a minute in length and coming 8-10 minutes apart. They were very manageable, so I wasn’t sure whether I was in my birthing time, but since they hadn’t let up by 5 am I texted my doula to let her know in advance that things might be starting. At 7 I got my son out of bed and fed him breakfast before sending him off with my in-laws for the day. I was worried that having him around would slow down the waves, and I also had an appointment at the hospital later that morning to fill out pre-induction paperwork. I wasn’t sure whether to keep the appointment, since things seemed to be starting, but I did and I’m so glad, because it took a bit of time and I wouldn’t have wanted to do it while in my active birthing time! I even told the registration staff that I was pretty sure I would be back later that day. Still, the waves were very manageable. Back at home, I started listening to my Hypnobabies birthing day hypnosis tracks and alternated resting and bouncing on my birth ball. I was still able to talk and laugh through each one, even though the waves did get closer together when I was on the birth ball. There was no intensity change, and I was beginning to get discouraged. I was bored! Shortly after 5, my mom (a CNM) suggested I do the Miles Circuit to try and encourage Theda to engage a bit more. I did the first position and by the end the waves were definitely amping up in intensity. As I moved to get off the bed, I felt a warm gush. My water had broken! There was a bit of meconium in the water, which was very triggering to my fears, but my mom assured me that it wasn’t nearly as much as there had been with Ambrose. Still, I allowed the fear to creep in. It was officially my birthing time, whether or not I was ready. Since I was GBS positive we left for the hospital to get the antibiotics started. Now things were really in motion. We arrived at the hospital shortly after 6 pm. By the time I was back in triage I was beginning to lose focus, but I made sure to have my Easy First Stage (Hypnobabies main birthing time hypnosis track) on for background cues. I did find Kerry’s prompts coming at the perfect time during the waves! Still, I was checked and found to be at 3 cm, which was discouraging. I had such a long way to go! From triage we got into a room and I bounced on my ball at the edge of the bed while working through each intense wave. About an hour after my first check I felt like I had to poop (just poop, I knew!) but the nurse checked me just in case, and I was at 5 cm. Progress! An hour after that I was beginning to make pushy noises. 8 cm! Things were really happening fast and furiously, and I’d pretty much completely lost focus on my Hypnobabies cues, but I was trying my hardest to relax through each wave. At 9:05 the pushy feelings were ramping up. The nurse checked me once again and found a cervical rim, so she suggested I walk to the bathroom to try and help complete the dilation. Boy did that work! I had just made it to the door when I had my first real roar of a push. They rushed me back to the bed and the doctor came in. I wanted to push on my hands and knees, but he was proactive given my past birth and had me push while supported on my back so he could do maneuvers as needed to help Theda out. (She was also measuring big, like her brother.) I really didn’t know what was going on — my eyes were closed, and I was letting people move me around as needed, while also pushing with all my might. Theda arrived after about 10-15 minutes of pushing! As with her brother, she had a bit of trouble breathing, so she was cut from me and put on the CPAP, which did the trick. Soon her cries came through loud and clear! She was placed in my arms and it was sheer joy. My baby was born after just 4 intense hours of active birthing time! Was it a discomfort-free birthing time? Not for me, phew! Am I satisfied with my Hypnobabies experience? 100% yes. Even though I may not have felt my hypno-anesthesia as I was hoping, I credit Hypnobabies for helping me work through my fears and teaching me how to relax myself as best I could to allow my body to do the work of opening to let Theda into the world. I’m so grateful for my experience. It really was a new birth — the healing birth I was hoping for — and Theda is a new baby unique unto herself!